Welcome to our third installment on our series of reviews about the *new* Young Animal imprint from DC comics. The first review about Cave Carson Has a Cybernetic Eye can be read here, and a Shade the Changing Girl review can be read here. 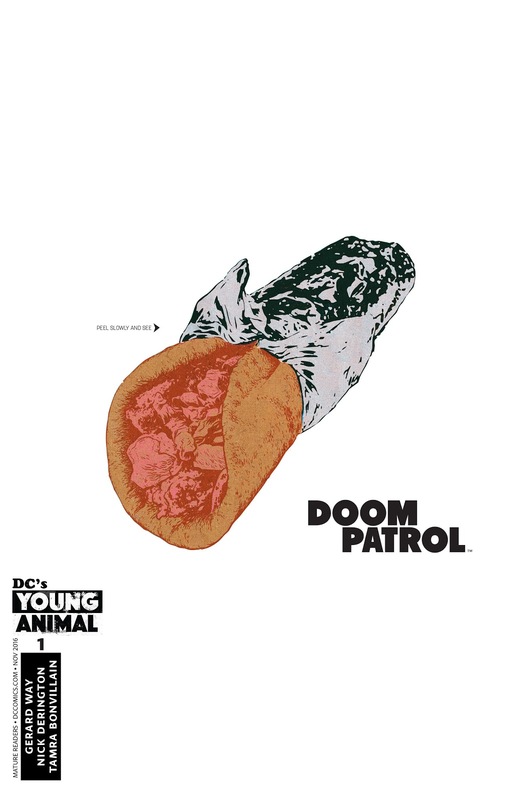 By the time you read this, Young Animal's Doom Patrol #1 will have been released a bit more than a year ago (hence the 'one year later' bit added to the title of this article) and is already involved in a new Justice League America/Doom Patrol cross-over. 1) You've been hearing things about the new Young Animal Doom Patrol series, have no prior knowledge of Doom Patrol, are mildly interested and want to see what other readers/reviewers have to say about it. To you, this article may make or break your decision to pursue this further. 2) You've already a fan of this series, and are curious what other people are thinking. 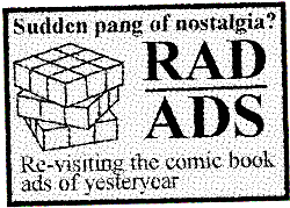 3) You have very vivid memories of Grant Morrison/Richard Case's run on Doom Patrol from the late 80s/early 90s. You actually consider the Morrison/Case run as the apex of the Doom Patrol's comic book career, and don't believe anything could ever come close to touching that. If you're in category #1, well, that's a lot of pressure on us. If you're in category #2, there ain't no shame in that and keep on reading. If you're in category #3,... I can totally emphasize. This is exactly the frame-of-mind we came from when writing this review. 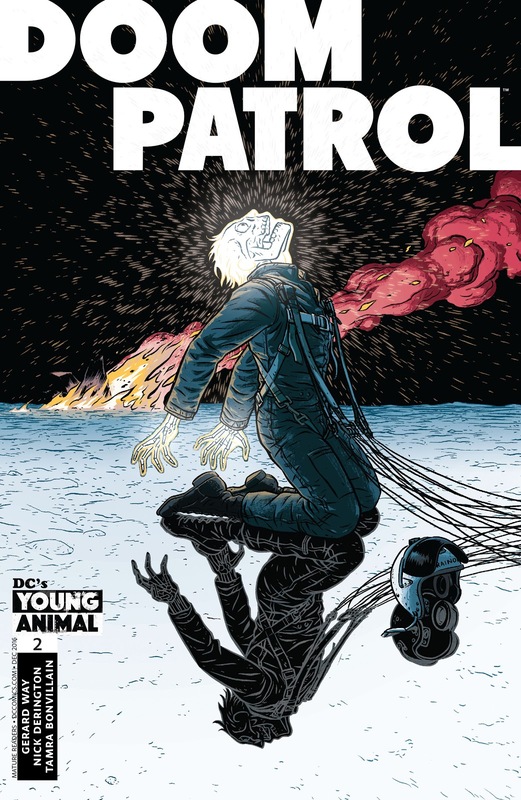 A better title would've been "Young Animal's Doom Patrol -- how does it compare to Grant Morrison's Vertigo Doom Patrol?" Admittedly, it's a little pretentious of me to state that the Morrison/Case run was the *best* version of Doom Patrol ever. 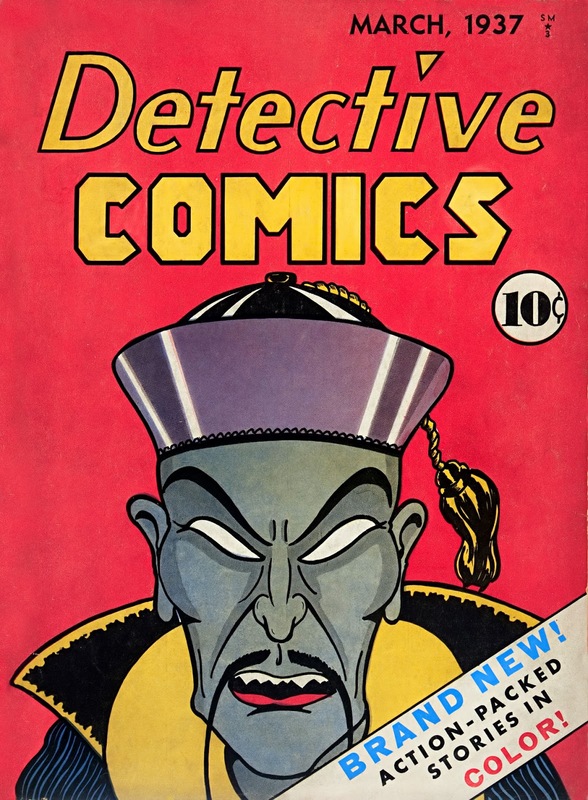 Don't get me wrong -- I enjoy the occasional re-read of the Drake/Haney/Premiani Silver Age stories, and am a big fan of the 1980's Kupperberg/Lightle revival -- but the Morrison/Case run brought a whole new level of weird and interesting to the title, so much so that it's difficult to stop reading once you start. 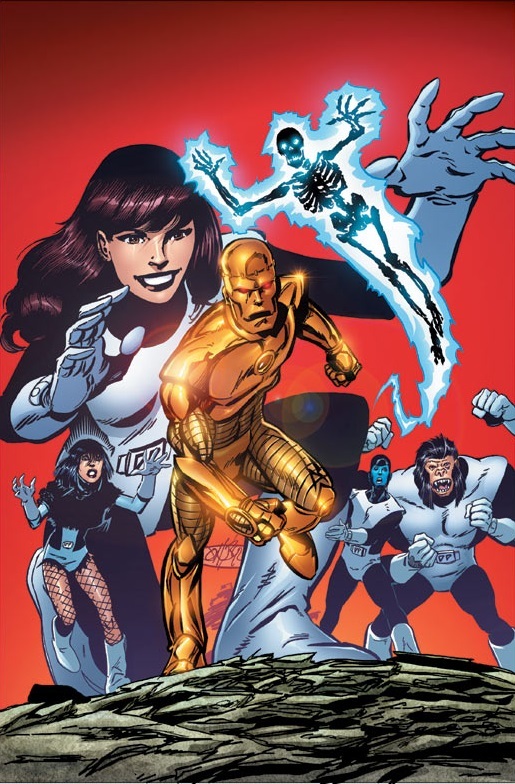 To date, it would seem that Byrne's 2004 Doom Patrol relaunch has been the most 'misunderstood' by fans. Which brings us to Young Animal's new Doom Patrol relaunch (or, as I like to call it: 'Doom Patrol volume 6'). In the effort of keeping this review totally unbiased, I'm proud to announce that I've managed to go spoiler-free since this relaunch had been announced back in 2016 -- which really wasn't easy considering this series seems to already have a HUGE twitter fan following and updates get retweeted A LOT. Right out of the gate, I'm going to declare that I had high hopes for this project (and the Young Animal imprint in general) due to Gerard Way's involvement. 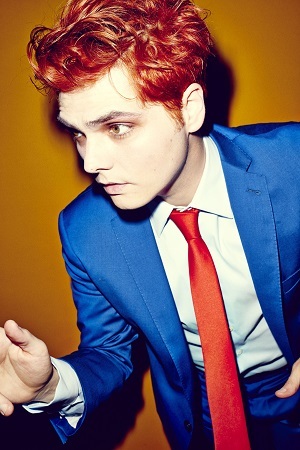 If you didn't already know, Way is best known for being a singer/songwriter/musician in the alternative rock band My Chemical Romance, has already authored an Eisner Award-winning comic book series (Dark Horse's The Umbrella Academy), and grew up reading and loving the same 'edgier' comics that I did (ex: Dark Horse's Grendel Tales, Vertigo's Doom Patrol) -- so really, how could this go wrong? 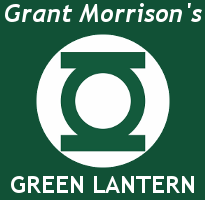 Also, did we mention he's pals with Grant Morrison*? *yes, that's Grant Morrison in My Chemical Romance's 'Na Na Na' music video. 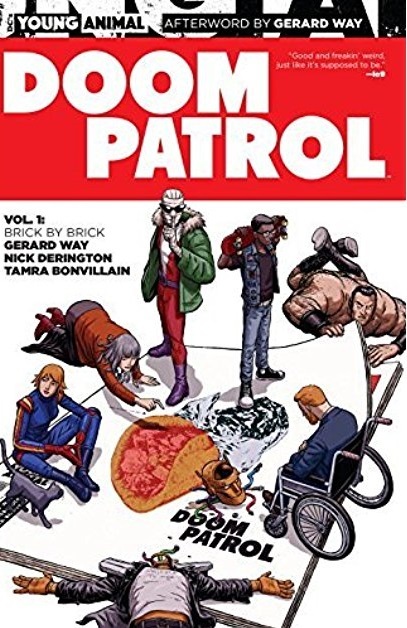 All to say, the prospect of 'fresh, young talent' looking at this team with a new perspective may just be the shot in the arm the Doom Patrol need -- not to mention that a younger, newer audience might start looking at these books (because Gerard Way brings instant street cred). "It's a really amazing meeting, and the energy in the room is fully charged. We talk about DOOM PATROL first -- I explain that the version of DOOM PATROL I was working on was something entirely different from what was going on in more mainstream books, and that I wasn't sure where DOOM PATROL sat in that universe. I felt that if DOOM PATROL came out on its own, it would feel pretty lonely. It felt like it needed a movement behind it -- the next wave of weird. At this point, Jim says "imprint", and we start rolling, we start talking about other characters." 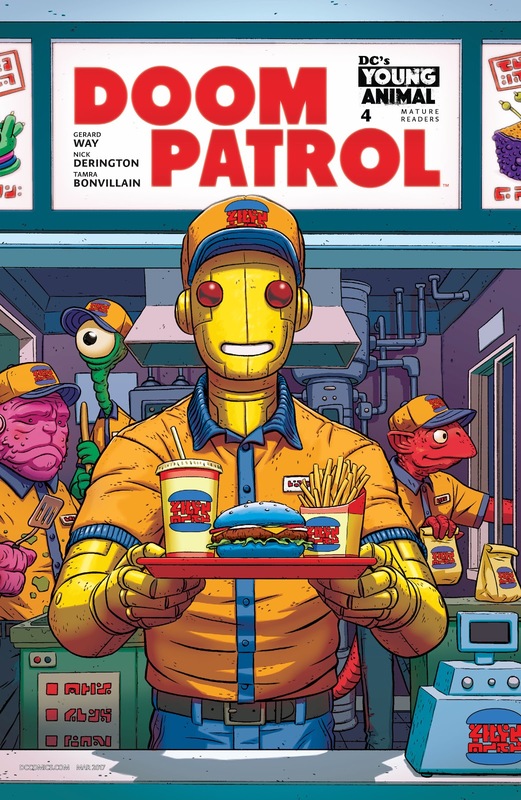 If you're reading between the lines here, you're probably recognizing that the Doom Patrol paved the way for Mother Panic, Shade the Changing Girl and Cave Carson Has A Cybernetic Eye -- and you'd be correct. 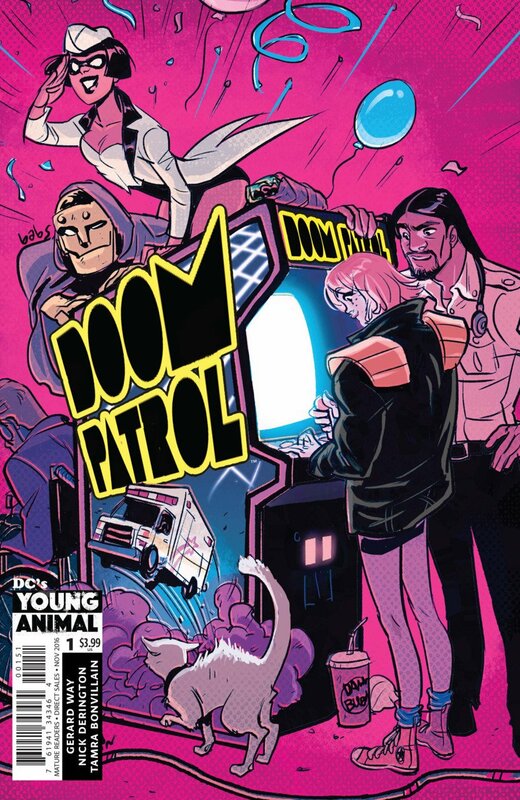 This is a review of the Doom Patrol v1: Brick By Brick TPB -- which collects the first six issues of volume 6, along with promotional art and variant covers for the series. I'm going to do my absolute best to keep this completely objective and unbiased review spoiler-free, but I should probably mention that I had to read this TPB twice; once because it was so damned good and flew by so fast, and the second time to analyse why I liked it so much. Sometimes it's not enough to just say something is 'good', and you need to explain/understand why it's so good. The majority of the first issue deals with the introduction of a new character (who will most likely be joining the team). This isn't anything new; every creative team working on a new Doom Patrol series seems to either want to add their own newly-created characters into the mix [see: Fever, Freak, Kid Slick, Faith, Grunt, and Nudge] or add an obscure DC character that nobody has really thought about in a while [see: Metamorpho, Doctor Light, Bumblebee, Vox, Elongated Man, and Ambush Bug]. Since you can't seem to have a Doom Patrol without a Cliff Steele/Robotman (he's in every incarnation of the team), Robotman makes an appearance -- and once he does, everything starts to come together and it starts to feel like a Doom Patrol adventure. The big 'Robotman reveal' from issue #1 in a scene that kinda reminds me of the opening sequence from 1983's Return of the Jedi. Props to Nick Derington and his versatile penciling skillz for giving this sequence some variety. The first issue also needs to set the momentum for the series -- typically by presenting some sort of ominous mystery that will keep the reader interested in checking out the next issue. Thankfully, Doom Patrol v6 #1 does exactly that. The pacing in issue #1 is a little choppy (it's obvious that the creative team is trying to set up subplots for a bigger storyline) but everything will make sense by issue #6. I promise. Issue #2 re-introduces even more former members of the original Doom Patrol, including one who hasn't been seen since he starred in his own 1996 mini-series. [I don't know why I'm trying to keep this a secret, they're all right there on the front cover of the TPB.] 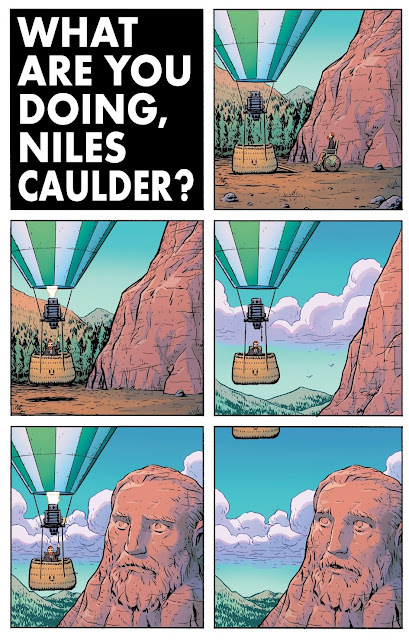 From here on, the story picks up and moves at a very quick pace: villains are revealed, Doom Patrol members have origins explained, there's a healthy dose of weirdness, mysteries are resolved, and the team is reunited with another long-lost member. 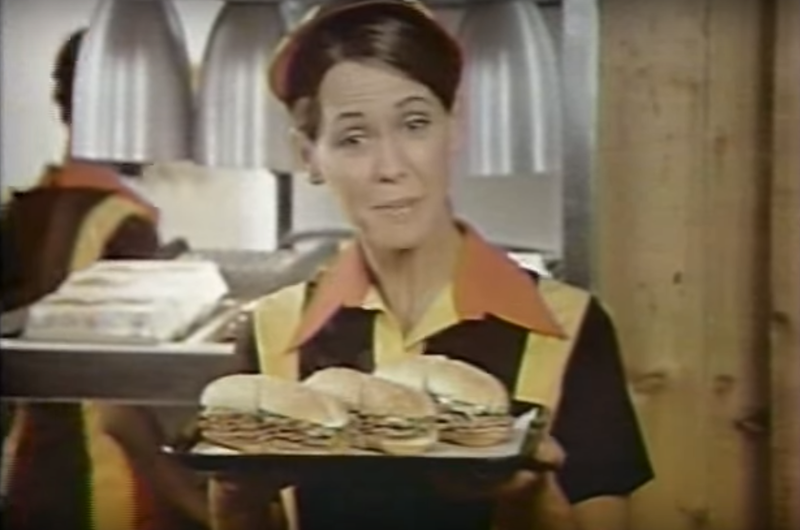 The entire series is filled with imagery like this; homages to things from the 1970/1980s -- nostalgia that breeds familiarity. This is like crack to an 80s pop culture nerd like me. Some of these are really obvious and in-your-face (ex: parody of Crisis on Infinite Earths #5 cover in Doom Patrol v6 #3), while some of them are way more subtle and are going to drive you nuts trying to figure what they're referencing. 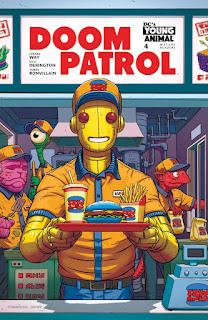 The cover of Doom Patrol v6 #4 appears to be referencing a classic Burger King ad I can't seem to find on google image search. In the meanwhile, I'll just stick a screenshot from a 1980s Burger King TV ad so you get the idea. This... looks familiar. 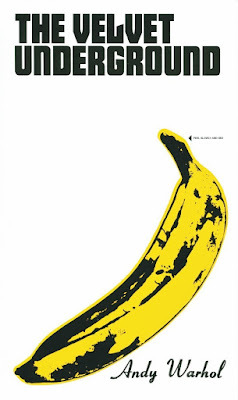 I can't 'place' this, but it seems to remind me of a cover of a book I remember reading. Do any of our readers know? Hey, any Morrison/Case Doom Patrol fans remember this map? So, all this to say, there's a lot of visual treats in here to keep you paying attention. (I'm sure there were plenty that went completely over my head, too.) As far as pacing goes, Gerard Way's writing brings a lot to the table: it's not always linear, and sometimes there are non sequitur (albeit humorous) interludes, but it's entertaining and full of twists and turns that seem to tie up into a neat little bow by the end. As a whole package, the Doom Patrol is weird and quirky -- but that's the best possible scenario. 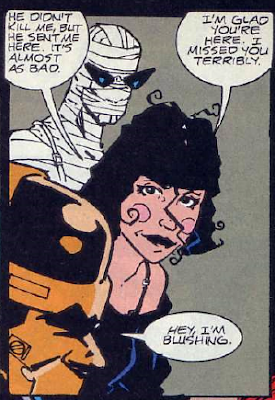 Doom Patrol, done correctly, needs to be really frickin' weird. 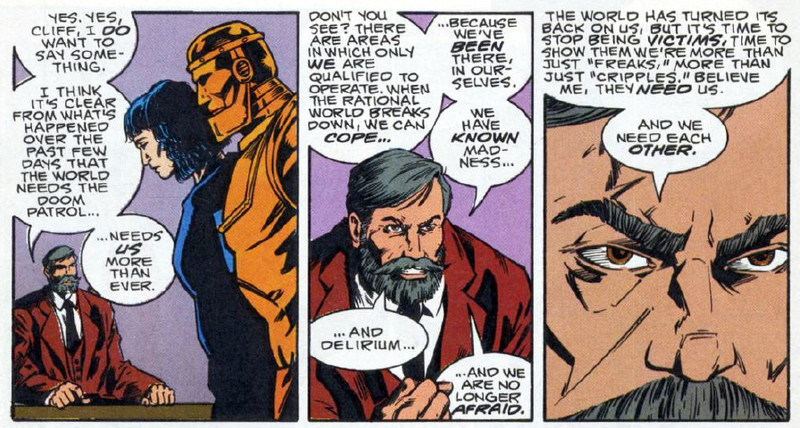 Or, more accurately, if Doom Patrol isn't weird, you're doing it wrong. Anytime a *new* Doom Patrol series is launched, I tend to approach with hesitation and the first thing I take a look at is the team roster. Often, a team book's roster can make or break the series. Putting the band back together (so to speak), was a clever move on behalf of the creative team. In my mind's eye, the Morrison/Case Doom Patrol team was the *best* team. 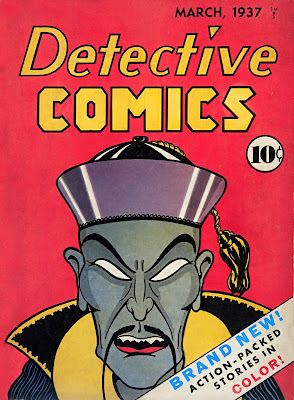 The Doom Patrol NEED to be a crew of reluctant heroes shanghaied into a situation where they're forced to save the world. [They can't be battling petty street crime, either. It needs to be a threat of Eldritch horror proportions.] The Chief NEEDS to be engineering some sort of scheme from the background. Negative Man NEEDS to somehow be involved. Robotman NEEDS to be wanting to punch stuff. All the while, it needs to have a bit of humor and not take itself too seriously. A lot of interesting and entertaining stuff happens in the span of six issues -- and it's enough to make you feel a little sorry that the TPB only collects the first six issues (and not all ten issues) of the sixth volume. 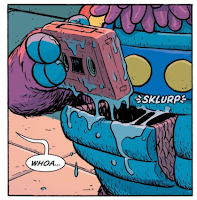 Nick Derington's art is gorgeous, Tamra Bonvillain's colors pop, and Gerard Way weaves an enthralling tale filled with a healthy dose of weirdness, nods to previous Doom Patrol continuity and fistfights. So, to conclude, yeah I think that this new Young Animal Doom Patrol sticks to the spirit of the Vertigo Doom Patrol, and if you're a fan of the Grant Morrison/Richard Case run you will definitely get a kick out of this. I'm having trouble deciding whether I should recommend buying the TPB, or tracking down the individual issues. While the TPB has all six issues (and variant covers and promo art) in a collected edition, the singles issues have previews of the other Young Animal titles (including Michael Allred's Bug! The Adventures of Forager! 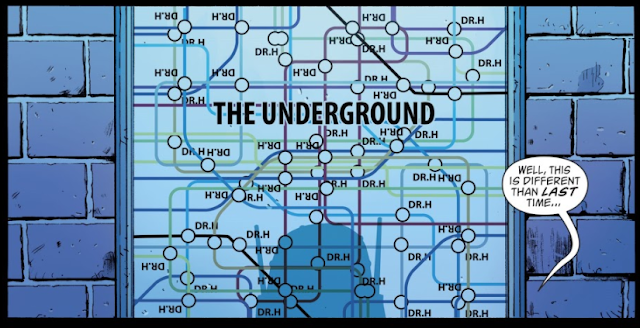 ), the extra Who's Who entries, and Brandon Bird's brilliant 'Bane's Coloring Corner'. Tough call, really. 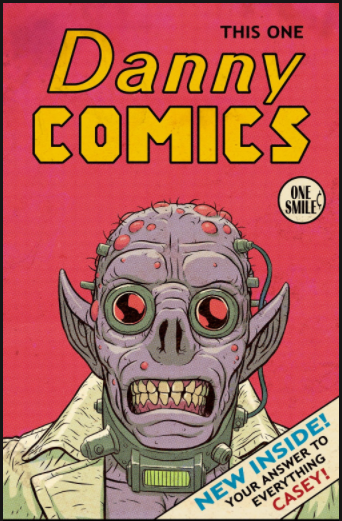 Big thanks to Paul Hix of the Waiting For Doom podcast -- a great bunch of guys who love nothing more than talking about the Doom Patrol. You can find them on facebook and twitter. If you liked this article, you might enjoy our interview with Steve Lightle about why he left the 1987 Doom Patrol series.